Multiplayer immersive games: Titanfall, Hearthstone, and the best video games of 2014. Entry 5: E-sports vs. e-arts, and why I’ve never even played League of Legends. 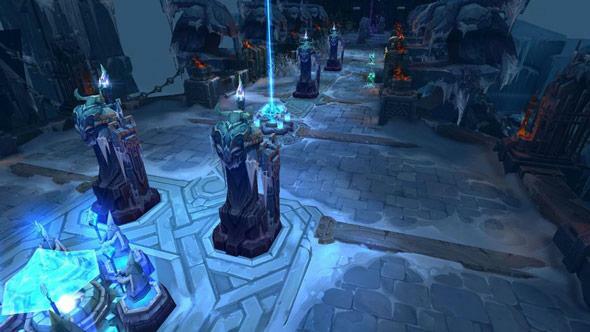 League of Legends: More a sport than an artwork? I have three contradictory reactions to Stephen’s contention that we (I?) spend too much time evangelizing for the merits of interactive stories and not enough time celebrating the satisfactions of deep engagement with interactive systems. The first is that it’s both a false dichotomy and an unfair description of my list, which includes Titanfall, a multiplayer-only shooter about running across walls and calling upon Brobdingnagian robots to aid you from the sky; Desert Golfing, an iPhone compulsion that uses Angry Birds-style swiping to prompt questions about permanence and fate; and Hearthstone, a free-to-play card game that’s about carefully building the right deck and then competing with it against other humans. I included Desert Golfing and Hearthstone precisely because I spent a lot of time playing them when no one was paying me for the pleasure. The second is that it’s a totally fair jab. Like Stephen, I tend to play a game because I’m reviewing it or writing about it, and then I forget about it as I move on to the next thing. So certain wonderful, replayable multiplayer games from 2014—Sportsfriends and Towerfall Ascension in particular—got less than their due from me. Embarrassingly, I’ve never even played League of Legends or Dota 2. (Rectifying that should be my 2015 resolution. There, I just made it, in public no less.) And I don’t even particularly want more games like Hearthstone, so if a year-end list is a statement of values, or a declaration of what a critic desires in video games, then maybe I should have left it off and replaced it with, I dunno, Make It Rain, a brief and deft satire of mobile gaming that—as Cookie Clicker did for Stephen—led me to reflect on the meaninglessness of digital accumulation. This is going to sound ridiculous, because it is, but if Max Weber had written an iPhone game instead of The Protestant Ethic and the Spirit of Capitalism, he would have written Make It Rain. Are our TV critics missing something important about what it means to be a television viewer in 2014 by never talking about NFL broadcasts? Indisputably. Do we care? Not especially. Similarly, I think the divide in video games between “e-sports” and, for lack of a better term, “e-arts” is becoming wider. I don’t want to sound like a Gamergater, suggesting that certain forms of interactive entertainment are video games while others are not worthy of the term. That’s not what I’m saying at all. But as someone whose primary outlet is the Arts section of the New York Times, I think it is right and meet that I spend the majority of my time on the video games that are boldly exploring the frontiers of make-believe, and that I should spend less of my time on video games that are pure competitions. I love sports. I watch a lot of sports. I find athletic competition and spectation to be full of joy and despair and atavistic sublimation of the individual to the group. The digital equivalents of it are worth writing about. But in a creative form that’s incomprehensibly vast and fundamentally ungrokkable by a lone human, my primary beat lies elsewhere for now. Did I say the word Gamergate? Earlier this year, Laura described Gamergate as, I think it’s fair to say, a movement of dead-enders who are lashing out because they have already lost. How does the Video Game Club feel about Gamergate now that the heat of the summer has faded? In the I Love the 2010s VH1 special, will Gamergate be a long-forgotten comet used as a nostalgic punch line? Or is it—or a similar movement with a different name—a permanent fixture of games culture? And have we really gone this long without talking about Flappy Bird?